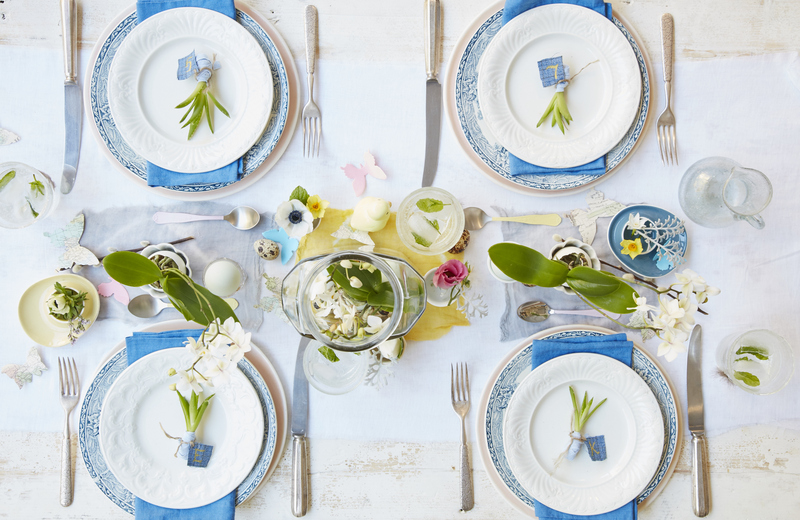 Create beautiful table decorations using pretty pastels, seasonal blooms and egg-inspired touches to delight guests at a springtime get-together. Make a hole in one end of a fresh duck egg (use the egg itself to make an omelette, if you like), the swill out the empty shell. Remove a mini orchid from its pot and tease away most of the soil. Either sit the roots around the shell, fastening with twine. Place in a large jar along with other duck eggs, such as quail or blue duck eggs. The eggshell orchid holders also look good in pretty egg cups. You can report the orchids after your event. To make fresh mint ice cubes with leaves perfectly positioned in the middle of each cube, fill an ice cube tray to halfway, add a leaf to each cube, then freeze. Once frozen, add more water to fill, then freeze again. Cut some strips from an old T-shirt and wind them around the roots of a few aloe vera springs. Cut some small squares from an old pair of jeans. Using a thick needle, make a hole in one corner, thread the hole with a piece of twine, and tie it around the bulb. Paint your guests initials on the squares of denim. – Use mismatched glasses and eggcups to hold a few spring blooms. – Use a stencil and cut butterflies from old maps.